An infrared spectrum gives information about characteristic molecular vibrations of specific groups in molecules. Fourier transform infrared spectroscopy can be applied to study lipids and proteins in cells or tissues. Spectra can be collected during cooling, heating, or dehydration of a sample using a temperature-controlled sample holder or a sample holder for controlled dehydration. In the current chapter, acquisition and analysis of infrared spectra during cooling, warming, or dehydration is described. Spectra analysis involving assessment of specific band positions, areas, or ratios is described. Special emphasis is given on studying membrane phase behavior and protein denaturation in cells or tissues. 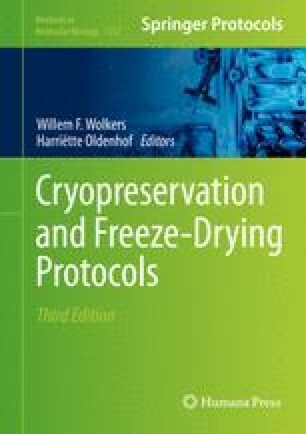 In addition, methods are presented to determine the water-to-ice phase change during freezing, dehydration kinetics, and the glass transition temperature of amorphous systems. This work is supported by funding from the German Research Foundation (DFG, Deutsche Forschungsgemeinschaft) for the Cluster of Excellence “From Regenerative Biology to Reconstructive Therapy” (REBIRTH).